As a business leader, thought leader, or business owner, you know the world of leadership has changed. Your organisation or business is changing fast, your team members expect more from you, and you’re expected to build your own personal brand as a leader. 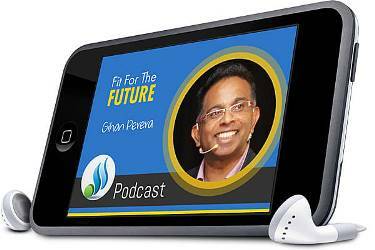 The Fit For the Future Podcast helps you navigate this fast-changing world by bringing you ideas, information, interviews and insights for leveraging your leadership and being fit for the future. LeaderSpeak The ability to craft and deliver compelling messages is a key leadership imperative, but many leaders struggle to be influential in a cluttered world. Rohan Dredge teaches leaders the skill of LeaderSpeak. In this interview, he shares what it takes to transform your messages to be truly influential. Listen To the Episode Visit Rohan’s Web site here. Leadership Peak Performance Many leaders struggle to maintain energy throughout their day, due to tight deadlines, competing priorities, and increasing demands on their time. In this episode, peak performance specialist Julie Meek provides simple and effective strategies for energy, stamina and productivity. Listen To the Episode Visit Julie’s Web site here. Using Conflict for Creativity and Action Conflict is inevitable in our fast-paced, diverse, global world. Many people think the solution to conflict is to resolve it, but Matt Lumsdaine believes in using conflict as a positive force and transforming it into creative and constructive activity. Listen To the Episode Visit Matt’s Web site here. Create a Personal Brand with Impact Personal branding is for everybody, and a strong personal brand has never been as important. In this interview, Jane Anderson talks about the three elements of building a powerful personal brand: clarity, communication, and control. Listen To the Episode Visit Jane’s Web site here. Using Your Brain For a Change In an uncertain and ambiguous world, the leaders who have a flexible thinking style and growth mindset will succeed and bring out the best in their people. Jenny Brockis explains how to make the most of your grey matter to thrive, not just survive. Listen To the Episode Visit Jenny’s Web site here. The Networked Organisation Traditionally, an organisation has been driven by two hierarchies – the management hierarchy (a.k.a. organisation chart) and customer hierarchy (a.k.a. sales funnel). But that’s not enough anymore. In our connected world, we need the networked organisation, as Ken and Peter Everett explain in this episode. Listen To the Episode Visit the N2N Hub here. CQ: Cultural Intelligence – with Trisha Carter In our diverse, disperse and distributed world, organisations and teams are increasingly composed of people with differences – ethnic, generational, gender, and others. In this interview, cultural intelligence expert Trisha Carter talks about how to recognise, manage and embrace those differences to create more innovative teams. Listen To the Episode Contact Trisha Carter here. Leadership Wisdom – with Gary Pittard Leading a business has become more complex than ever, because of increasingly savvy customers, highly motivated but demanding team members, and a need to remain competitive in a fast-moving world. In this interview, Gary Pittard shares his wisdom from decades of experience leading teams and coaching leaders. Listen To the Episode Contact Gary Pittard here.